Hand Colored Postcard. Multi. Cardstock. 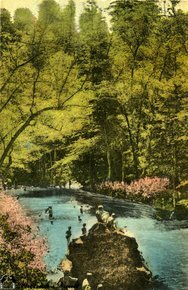 This hand colored card is titled, "River Inn Swimming Hole, Big Sur, California." The Albertype Co., Brooklyn, N.Y. Hand-colored. Unused.